Winners will be announced at the WAMMY Awards on March 15 at The State Theater in Falls Church, Virginia. Ganadores serán anunciados en los premios Wammies el 15 de Marzo en Falls Church, Virginia. Check out Elena & Los Fulanos submission for NPR’s Tiny Desk Concert Contest featuring Elena Lacayo (banjo, vocals), Danny Cervantes (violin), Andrew N (guitar, percussion), and special guest Cynthia Marie (piano, vocals). Miren el nuevo video de Elena & Los Fulanos con Elena Lacayo (banjo, voz), Danny Cervantes (volín), Andrew N (guitarra, percusión), e invitada especial Cynthia Marie (piano, voz). 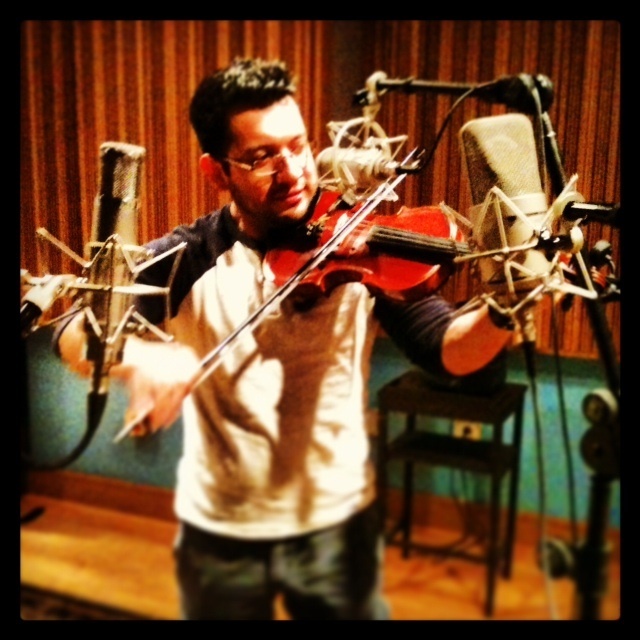 WASHINGTON, DC — My bilingual folk rock has a complicated identity. Like me, sometimes it feels a bit schizophrenic. But don’t all of us bicultural kids feel that way? I was born in the New Orleans, Louisiana to a family of Nicaraguan civil war refugees. When I was eight years old, after spending a number of years in Miami, my family decided to go to Nicaragua where I lived until I completed high school. You could say that my transition was rough. Up until I moved, I was just like any other eight-year-old American Latina – I understood Spanish but only spoke English, I loved McDonalds, fruit roll-ups and marshmallows more than anything, and I was used to the comfortable world of air conditioned rooms, hot water showers, and clean streets to which the US had made me accustomed. The U.S. had been my only home and I was happy. But my parents longed to return to Nicaragua. And so we went with them, leaving behind all that I knew and replacing it with a dirty, war-torn, scary land that was filled with bullet holes in buildings, cold showers, spiders, and strange smells. As a scar of Nicaragua’s many years of Civil War and the U.S. embargo, the country was devoid of any restaurants, chains, or brands that I could recognize (not to mention that it was virtually impossible for me to find any of the snacks I so cherished). Everything was in a language I couldn’t speak. Everything tasted funny. I missed the U.S. so much and came to idealize it as the embodiment of perfection. Years later, I finally returned to the U.S. to attend college in Indiana. But a great deal had changed about me. I was now fully bilingual, speaking and writing Spanish fluently. I had a more nuanced view of the U.S.; I had learned about our country’s complicated role in Nicaraguan history. The food I once thought to be disgusting I now cherished, like my beloved quesillos (a Nicaraguan meal made with cheese and tortilla). I loved the warmth of Nicaragua’s people and the breadth of Nicaraguan culture. People like me live in a grey area in between the two worlds that we straddle. We instinctively translate not only words, but also worlds, culture, humor, and points of view. We intuitively bridge misunderstandings between cultures because we simultaneously view our worlds as both natives and strangers. We can go from engaging in a heated political conversation about the U.S. and whether we measure up to our values in one minute to rebanando (Nicaraguan slang for joking) over a salsa dance in the next. Now that I live in DC, I still have the opportunity to return to Nicaragua frequently to visit my parents, three brothers, and my extended family who still live there. I am not only fully bilingual, but also fully binational and bicultural. We are true natives of both places, yet we don’t feel completely at home in either one without the other home we carry with us. In 2006, I moved to Washington DC to work in social justice and quickly fell into working on immigration issues. I found the work compelling because it allowed me to serve a poor and marginalized population that spoke to my own family history. It was also a space in which my cultural and language skills were an asset. It was during this time that I also really started writing music. 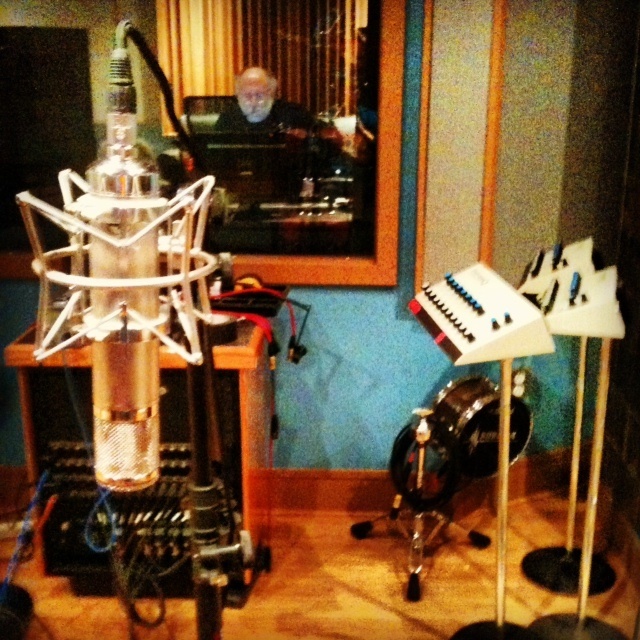 I come from a musical family and have loved singing since the very beginning. I taught myself how to play guitar in middle school (during the regular power outages in Managua) and continued to play through college. I was anxious to share my original songs with others but I was torn by the idea that I needed to choose a language in which to perform. I mean, I couldn’t write in both languages, could I? By the same token, neither language seemed right or complete to me. I didn’t know what to do. Finally, after months of turmoil, I decided that even if it was difficult and unconventional, the only way to be true to myself would be to write in both languages because that is who I am. And so, with the help of some talented friends, who themselves came from different cultural backgrounds, I formed a band called Elena & Los Fulanos. Finally, about two years ago, I quit my job to spend more time on this project. Earlier this summer, my band released its debut bilingual folk-rock album called Miel Venenosa. The songs are not only in English and Spanish, but they also include elements of different genres and styles within the folk traditions of both my cultures. For example, “Amor Migrante,” an immigrant mother’s love song to the child she left in her home country, is written with rhythmic Spanish-style guitars and even features some gritos. By contrast, the song “Carolina,” a folk-country tune with a rocking bass line and simple lyrics, showcases the quintessential American spirit that yearns to be independent and free. 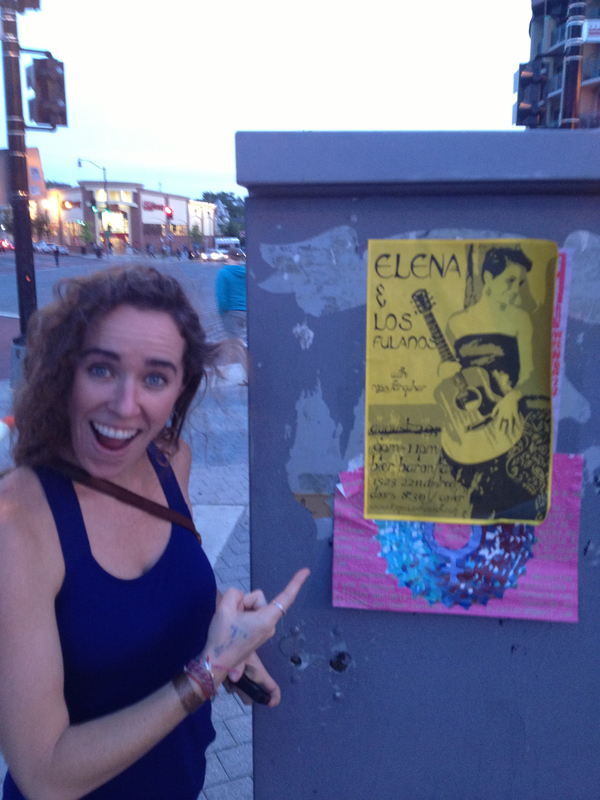 Elena Lacayo is the lead for Elena & Los Fulanos, a bilingual folk-rock band out of Washington, DC. 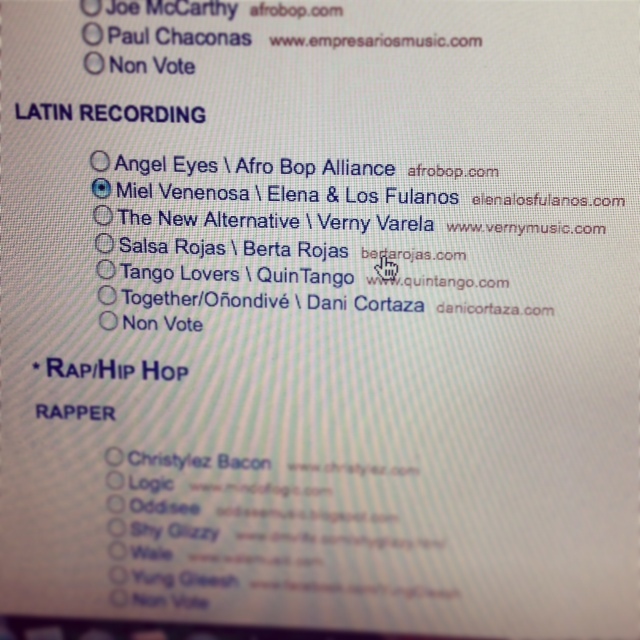 Their debut album, Miel Venenosa, is available on Itunes and CD Baby. 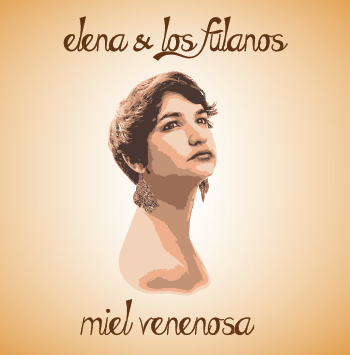 For more information, or to order a physical copy of their album, visit http://www.elenalosfulanos.com. 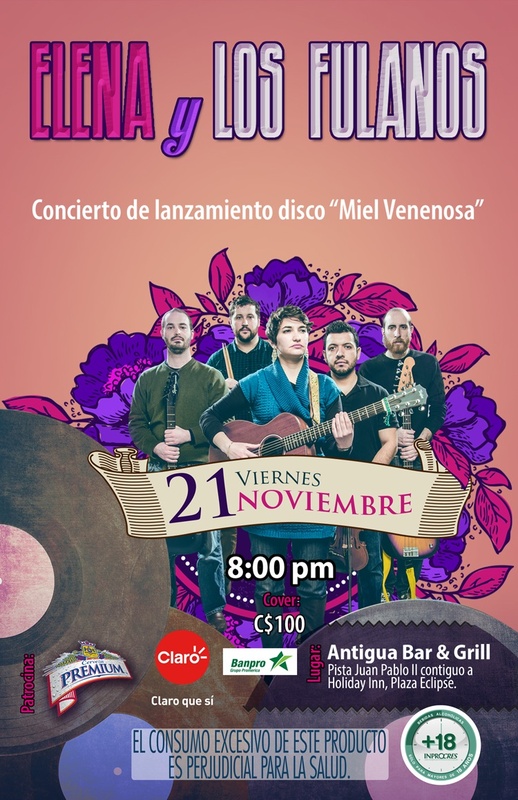 (Managua, Nicaragua) – Elena & Los Fulanos, un grupo musical bilingüe basado en Washington, DC, realizará el lanzamiento de su primer disco, Miel Venenosa, en Managua Nicaragua, el 21 de noviembre, 2014 en Antigua Bar & Grill, Pista Juan Pablo II contiguo a Holiday Inn Plaza Eclipse a las 8 p.m.
El disco fue lanzado a finales de julio en Washington, DC y ahora será lanzado de forma oficial en Managua, ciudad en la que creció Elena Lacayo, cantautora y fundadora del grupo musical. En el concierto, Elena será acompañada por músicos Nicaragüenses incluyendo a Andrés López-Harrison (bajo), Osman Delgado (violín), Edgard Aguilar (guitarra), y Álvaro Sandino (batería). Juntos tocarán Miel Venenosa en su totalidad. Miel Venenosa es un disco completo de 13 canciones en inglés y español, y contiene estilos y temas que demuestran la identidad bicultural del grupo. Por ejemplo, “Amor Migrante,” una canción de amor de una madre que dejó a su hijo en su país para trabajar en los Estados Unidos, demuestra características de música folklórica centroamericana mientras “Carolina,” una canción sobre el deseo de escaparse a un estado sureño de los Estados Unidos, usa elementos de la música “folk” y “country” americana y lleva a la audiencia hasta el sur de los Estados Unidos. “Queremos que nuestra música aborde los temas que salen a luz durante los encuentros de culturas distintas, encuentros que están pasando en nuestras comunidades, en nuestras familias, y dentro de nosotros mismos”, dijo Lacayo quien creció entre los Estados Unidos y Nicaragua y quien se identifica como americana y nicaragüense. “Aunque este disco se trata del camino que tomé para encontrar mi propia identidad cultural, también se trata del deseo universal de superar el aislamiento personal y de encontrar paz con diferentes elementos de nosotros mismos”. El disco fue financiado por amigos, familia, y admiradores de la banda por una campaña hecha completamente por internet usando “Indiegogo,” un servicio novedoso que permite a las personas recaudar fondos para llevar a cabo sus proyectos y sueños. “Estoy muy agradecida por el apoyo que recibí de gente Nicaragüense para poder hacer este disco” dijo Lacayo “ahora lo quiero presentar en vivo a los que contribuyeron a la campaña y al resto del pueblo nicaragüense.” El concierto será patrocinado por Canal 2, Cerveza Premium, Claro, y Banpro. El disco Miel Venenosa estará de venta en el concierto el 21 de noviembre en Antigua Bar & Grill. Copias digitales también se encuentran en Itunes, Bandcamp, y CD Baby. Para más información visita http://www.elenalosfulanos.com. Sigue Elena & Los Fulanos en Facebook y Twitter o añádete a su lista de correos electrónicos. The album release will be marked with a performance on Thursday, July 31, 2014 at Tropicalia, 2001 14th St. NW, in Washington D.C. at 7 p.m.
Miel Venenosa (or “Poisonous Honey”) is a full-length, 13-track English and Spanish album with styles and themes that highlight the bilingual and bicultural identity of the band. 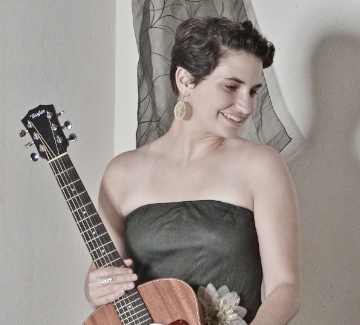 “Carolina,” a song about wanting to escape to the American South, borrows elements from American folk and country music, while “Amor Migrante,” a migrant mother’s love song to the son she left behind, uses Latin guitars to transport the listener to her Central American home country. The band came together on the streets of DC’s rapidly changing neighborhoods of Columbia Heights and Mt. Pleasant, where working immigrant communities co-exist with young political and nonprofit leaders. That is where Elena was introduced to the District’s punk music crowd and her future band members. Together they are part of the city’s growing indie and international music scene. The official release date for Miel Venenosa is Tuesday, July 29, 2014. For more information visit www.elenalosfulanos.com. 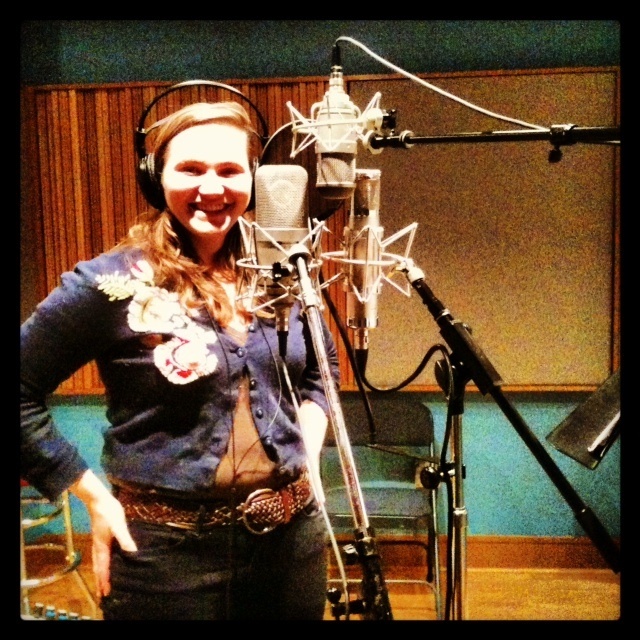 Follow Elena & Los Fulanos on Facebook, sign up for our email list, or tweet us@elenaMusical. 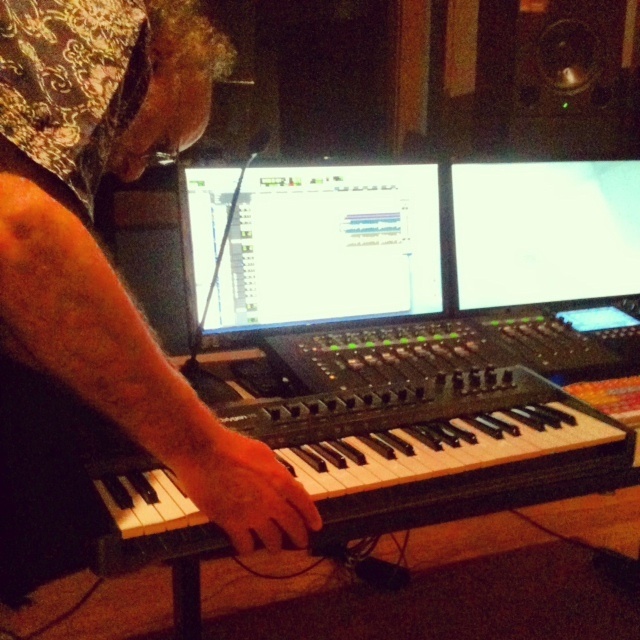 We’ve spent a bunch of time at Airshow Studios working on our upcoming album, Miel Venenosa. Check out our pictures below! Hemos pasado mucho tiempo grabando nuestro disco Miel Venenosa en los estudios de Airshow. ¡Aquí están unas fotos de nuestras sesiones! 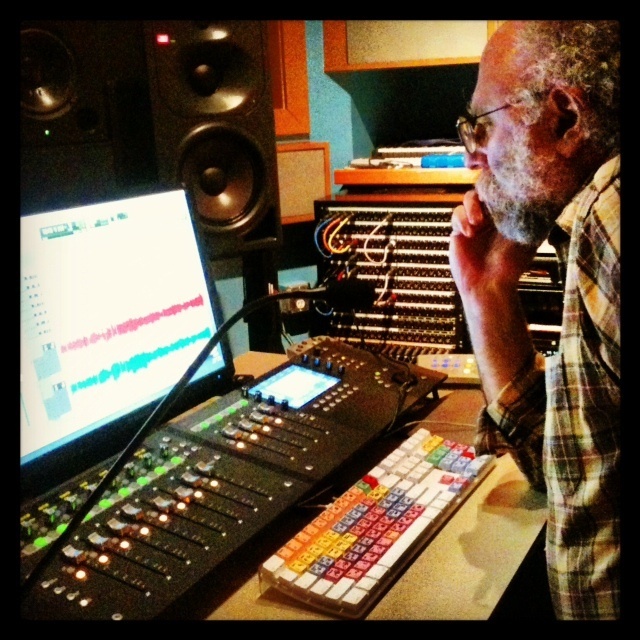 Grammy-award winning Charlie Pilzer edits “Quizás Sí” at Airshow. 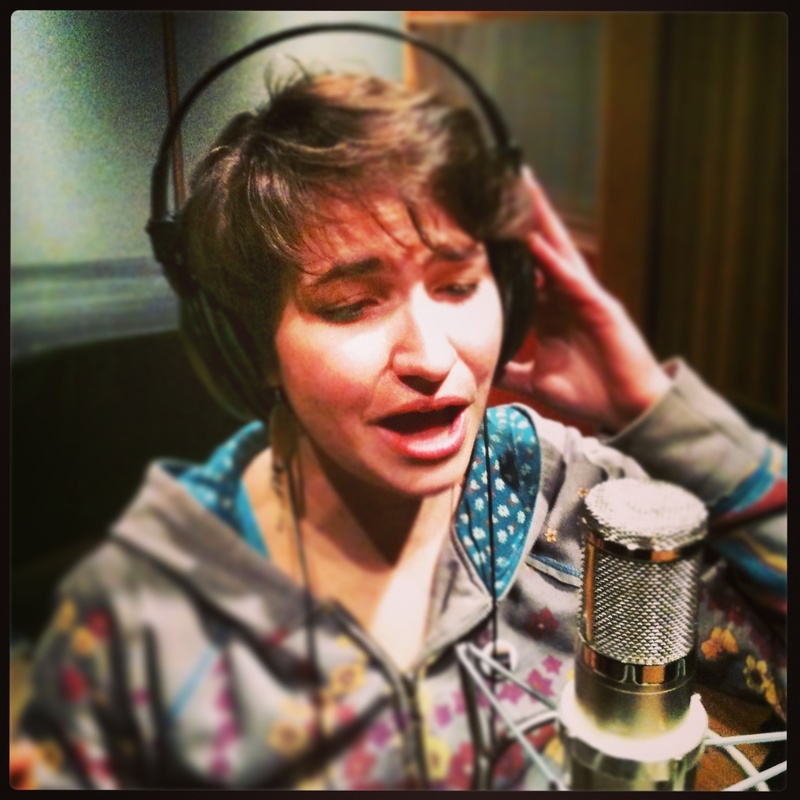 Letitia VanSant records backup vocals on the song “Tonight”. 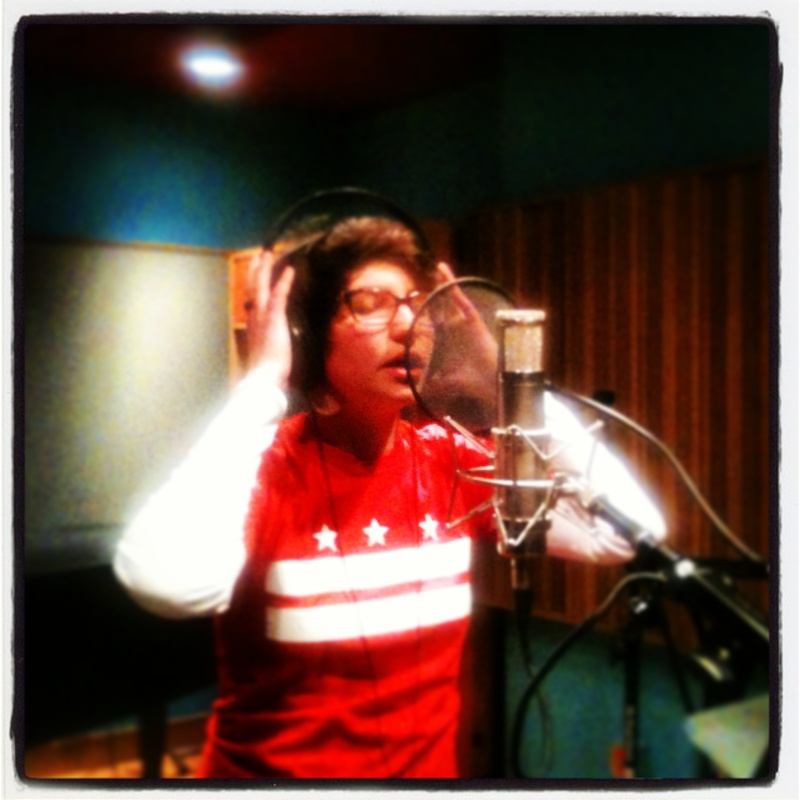 Elena records vocals while rocking some DC pride! Featured on National Nicaraguan Television! | ¡Saliendo en Vos TV! 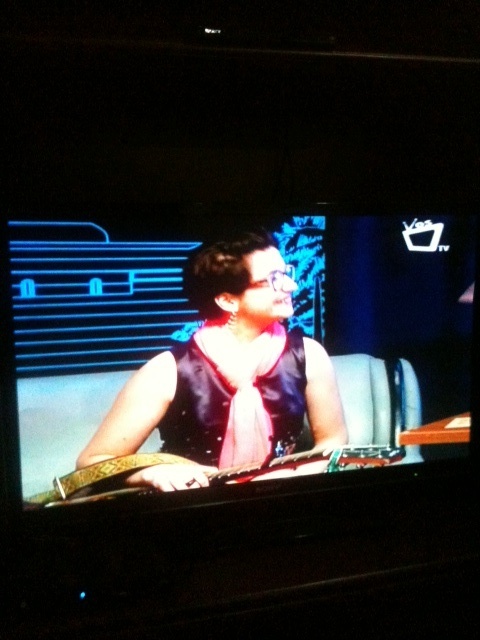 On March 11, Elena Lacayo, the lead for Elena & Los Fulanos, appeared on the national Nicaraguan television station Vos TV. She played the song “Quizás Sí” on live air and was then interviewed by “Que Bárbaro” host Luis Báez. Check out some pictures below! 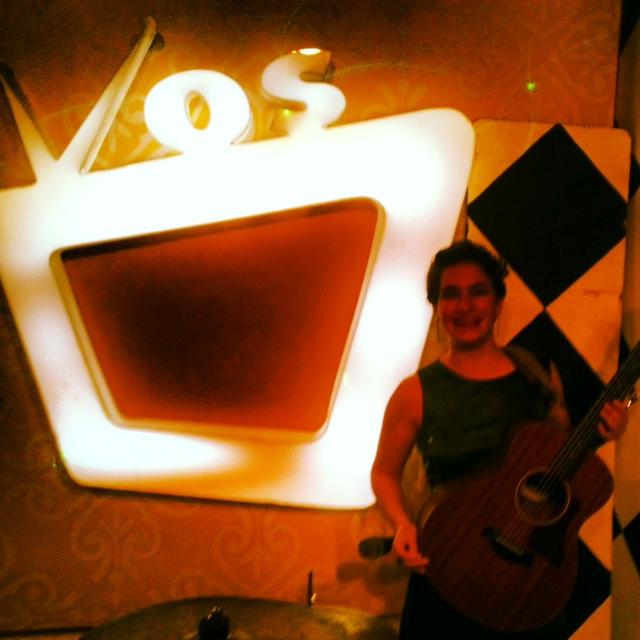 On the set of Vos TV, el orgullo Nicaraguense! 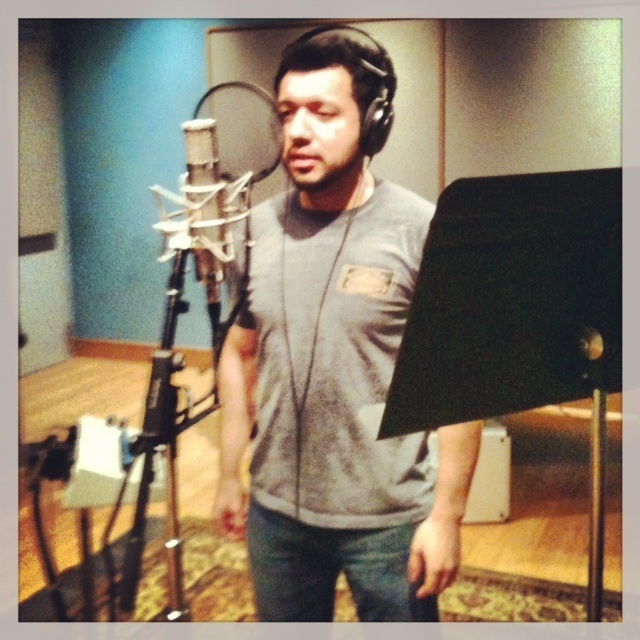 After Successful Fundraising, Recording has Begun! Thanks to a lot of hard work and to the generous contributions of many fans and supporters, Elena & Los Fulanos raised $8,651 — 25% over our initial goal. AMAZING! 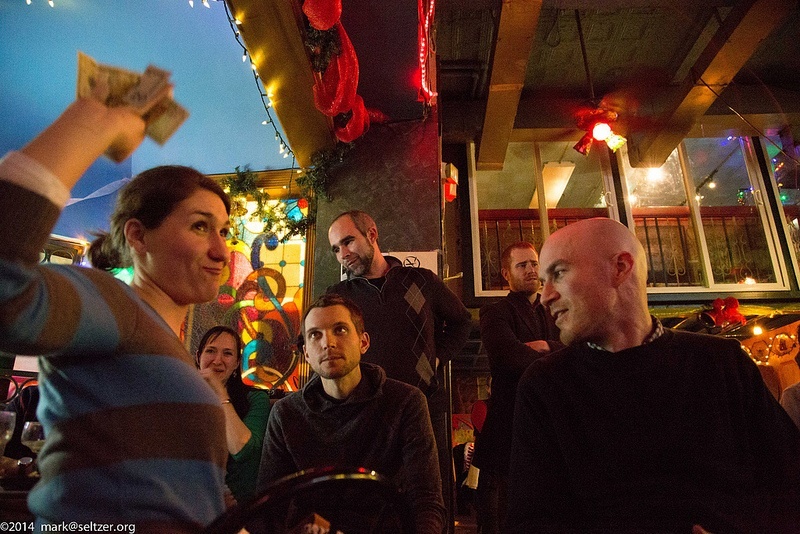 Fans celebrate donations as we progressed toward our fundraising goal at our show at Haydee’s Restaurant on January 5. First off, we want to thank all of you who so graciously supported us and contributed to our campaign. We could not have done it without you! Secondly, we want to let you all know that this financial support came just in time for us to head into the studio. 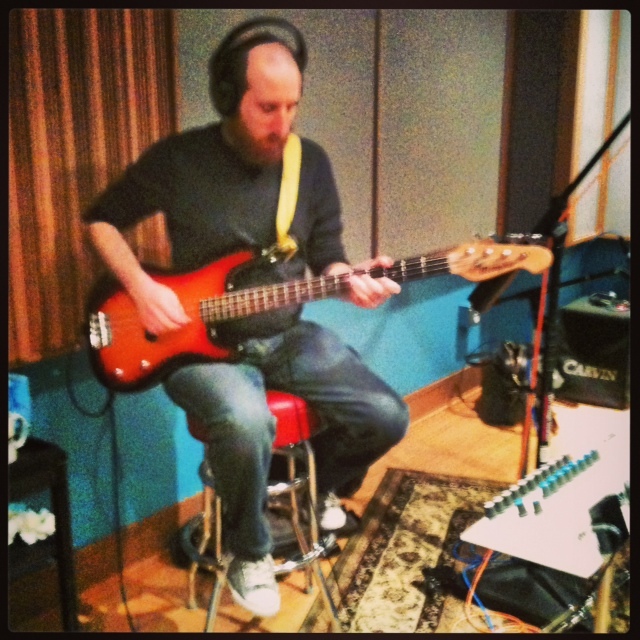 In fact, the weekend after we ended our campaign, Elena & Los Fulanos began recording with the talented Charlie Pilzer of Airshow Mastering in Takoma Park. 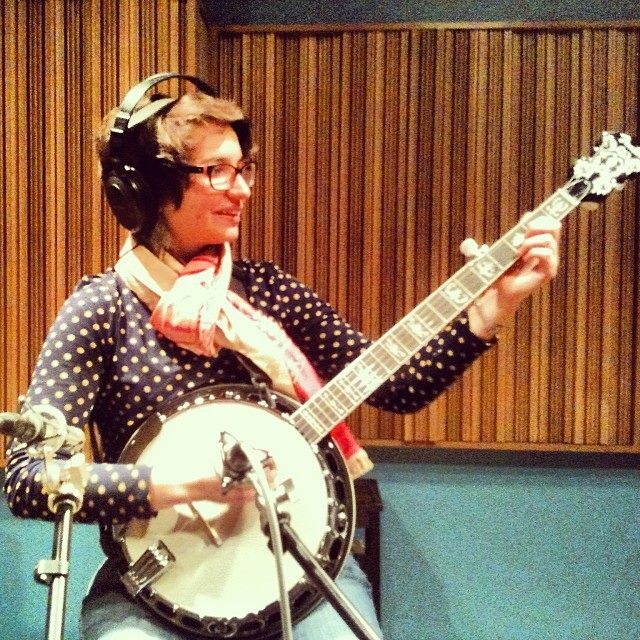 Elena records “Miel Venenosa” on the banjo. 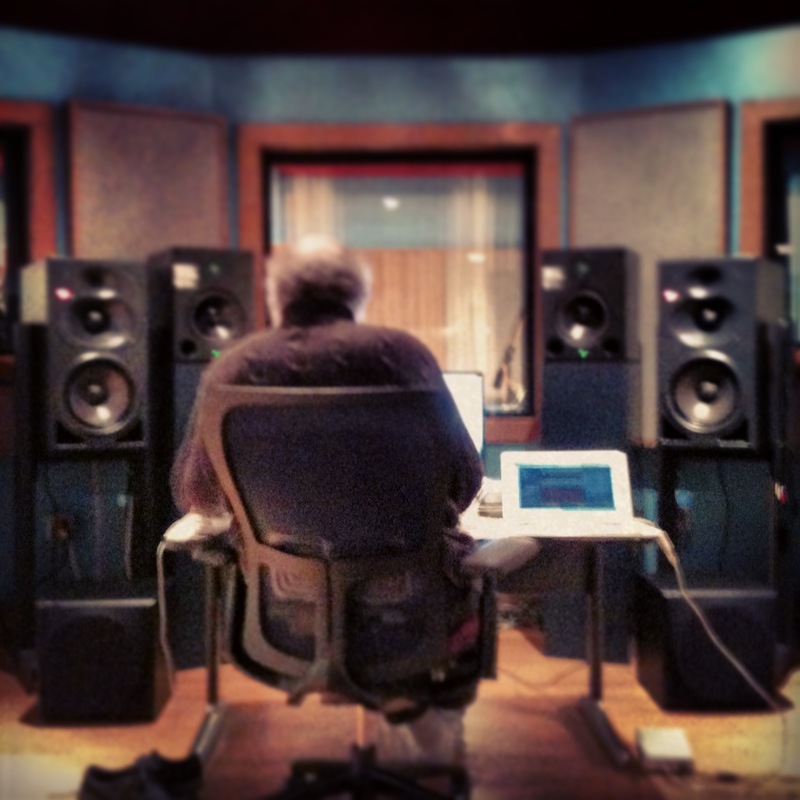 Charlie Pilzer of Airshow Mastering settles in to record Elena & Los Fulanos. We could not be more excited to work on this project and are ever grateful to your faith in us to do it. With your support, we will work hard to create a new and unique bilingual folk-rock album. Gracias a un gran esfuerzo y a la contribución de muchos de ustedes, Elena & Los Fulanos recaudó $8,651 — 25% mas de nuestra meta original! ¡INCREIBLE! Primero, queremos agradecer a todos ustedes que generosamente contribuyeron a nuestra campaña. ¡No lo podríamos haber hecho sin ustedes! Segundo, queremos informales que éste apoyo financiero viene al mejor momento ya que nos llego a momentos de entrar a grabar en un estudio profesional: El fin de semana después de terminar nuestra campaña, Elena & Los Fulanos comenzó a grabar con el talentoso Charlie Pilzer de Airshow Mastering en Takoma Park, Maryland. 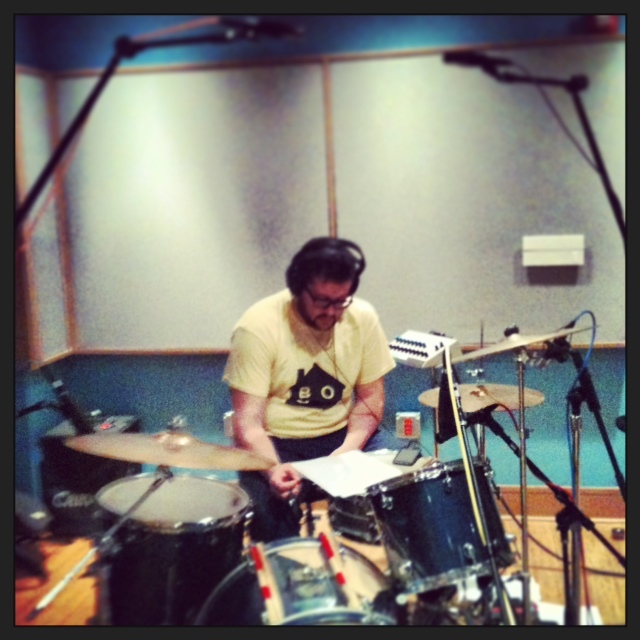 Andrew Graber se concentra en el arreglo de baterias para la cancion “Precious”. Estamos increíblemente emocionados de poder trabajar en este proyecto y estamos extremadamente agradecidos en la fé que han tenido en nosotros para poder lograrlo. Con el apoyo de ustedes, crearemos un disco de folk-rolk bilingüe innovador y único. Elena & Los Fulanos to Record their Debut Album! 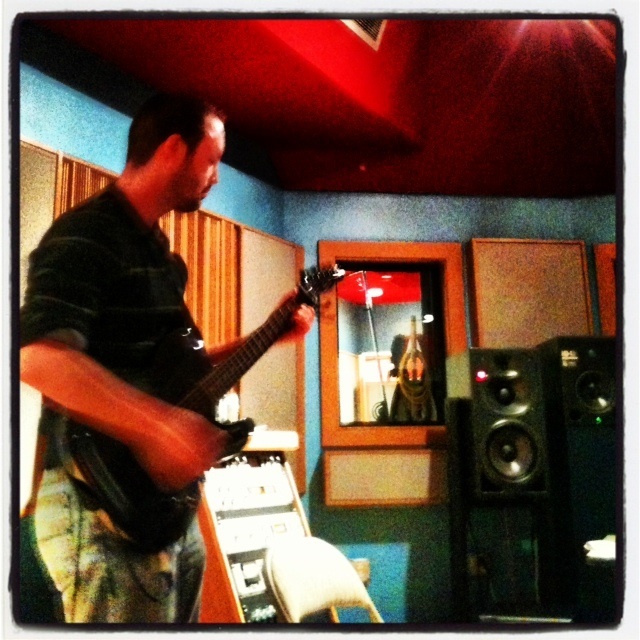 On November 8, Elena & Los Fulanos announced we would be recording our debut album! That’s right, it’s a big task, but we are excited to take on this new challenge. El 8 de noviembre, Elena & Los Fulanos anunciamos nuestros planes de grabar nuestro primer disco. Es una gran reto, pero sabemos que con su apoyo podemos lograrlo. Grabar un disco es un gran paso para nosotros y desafortunadamente, también es muy costoso. Aunque estamos intentando de mantener los costos bajos, aun así tendremos que pagar para grabar en un estudio profesional, el ingeniero de música, diseño, y producción. Uff! Es muchísimo dinero, pero sabemos que con tu apoyo podremos recaudar los fondos que necesitamos. Ayude a Elena & Los Fulanos recaudar fondos para grabar su primer disco! Thanks for your support! 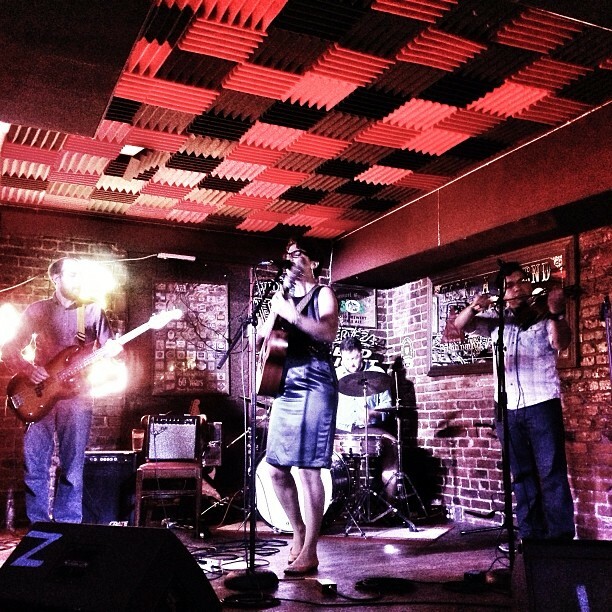 On August 29, Elena & Los Fulanos headlined at the Bier Baron with opening act Ross Farquhar. There was a great turnout, due in part to the poster campaign that got the word out across many DC neighborhoods. Eileen shows her enthusiasm for Elena & Los Fulanos street art. Picture by Daniel Osborne. People enjoyed great food and drink from the awesome menu and exquisite beer selection provided by one of DC’s newest venues. Plus, Elena & Los Fulanos premiered two new original songs: “Precious” (a heart-wrenching title) and “All We Have Left” (with a different reggae inspired-sound). Elena & Los Fulanos at The Bier Baron on August 28. Picture by Monica Fernandez. It was a great night! We appreciated all the support. Stay tuned for our the next show at The Dunes with The Family Hammer on September 14.